Radius MandolinTM Pickup. 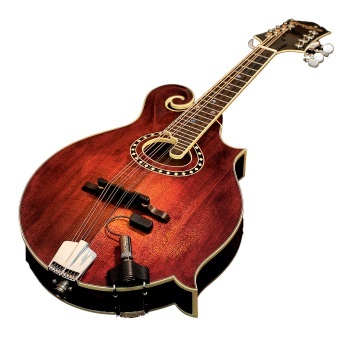 Radius Mandolin PickupThe Radius mandolin pickup is a hi-tech contact sensor that was designed to emulate the sound of a mic without the instability associated with microphones. The pickup installs easily to the instrument with mounting putty that is non-destructive to its finish. Inside of the pickup’s housing is a highly flexible film sensor that responds much like a mic diaphragm. The sensor is held in equilibrium and damped by opposing neodymium magnets that allow the pickup to respond to the instruments most subtle nuances. FEATURES: Radius pickup. Mounting putty. Clear adhesive pads. Permanent VHB pads. External jack mount.